Wild Orchid wins Cruising Class 1, while Kraken wins Overall Class Championship. SAN DIEGO — San Diego Yacht Club hosted the 2018 Beneteau Cup on Sept. 8 and 9, drawing sailors from all over Southern California (and even someone from Mexico City). There were 48 boats and more than 330 sailors competing in the regatta, which was sponsored by Mt. Gay. Trophies, provided by Ullman Sails, were provided to the top four finishers in each class. Winners also received Mt. Gay rum bottles and Beneteau Cup ball caps, among other gifts. Bruce and Audrey Toal won Cruise Class I aboard their Ocean 58, Wild Orchid. Cruise Class 2, which featured 16 boats, was won by Slaite, the Oceanis 40 helmed by Andy Moulds. 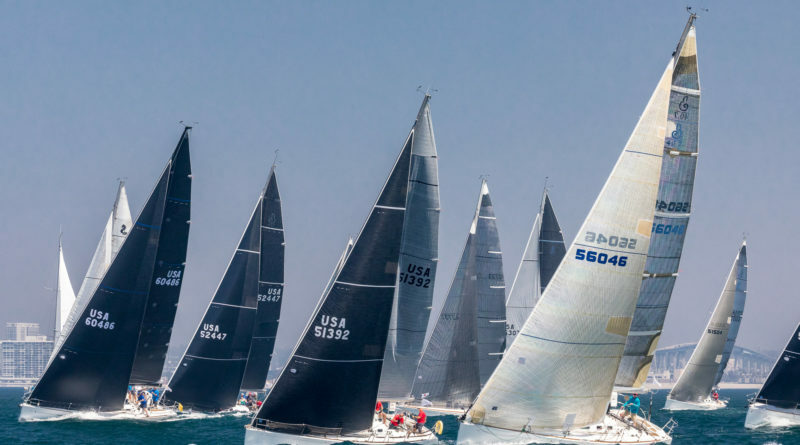 Precepts II, a highly modified First 40, won the 14-boat First Series Class. Thomas Shepard’s Kraken was both the Overall Class and 36.7 Class champion. “Every year, the best finishing Cruising boat and best finishing First Series Overall also receive awards on perpetual trophies, and this year Wild Orchid and Precepts II were the overall winners,” a released statement about the regatta said. Next year’s Beneteau Cup will take place Sept. 6-8.